Tom Cruise has been in so many sci-fi action movies that the phrase “I’m watching that Tom Cruise sci-fi movie” is about as helpful as proclaiming you would like an edible item to the indignant waiter at a restaurant. This particular one, ‘Edge of Tomorrow’, seems like it could well be a mixture of all those he’s ever been in and indeed may have had nothing new to say about anything, but director Doug Liman has actually made sure he selected source material that is clever and entertaining enough to barge its way in even if it wears its influences so clearly on its sleeve it might as well just be dressed in them. Based on a Japanese novel called ‘All You Need Is Kill’ the film follows Major William Cage, played by Cruise, who is an American army Major inexperienced in combat but with a background in advertising that allows him to be a major part of the recruitment drive for more soldiers at a time when the world is being invaded by giant crustacean-like aliens the ‘Mimics’, thus called for their astounding ability to mimic and negate the attacks of the humans, making them almost unbeatable. Suddenly thrust in to combat out of nowhere he almost immediately dies, but realises he can relive his first day on the front line every time this happens, leading him to meet Emily Blunt’s super soldier Rita Vrataski. While this set-up is intriguing and certainly makes for an interesting take on the battle against aliens, one cannot help but see direct similarities to films like Duncan Jones’ ‘Source Code’, a film with a very similar main concept, used for similar goals. This however can be forgiven in the sci-fi context where ideas and concepts are readily borrowed, so the fact it manages to keep it so entertaining and utilise its cast, which also features a gruff Brendan Gleeson and a chirpy, slightly insane Bill Paxton, as well as it does is something to cheer, because it’s definitely not boring. It does, however, miss an opportunity to be more than an entertaining two hour romp, often reducing its premise to a quirky one-liner or using it to provide us with more explosions when a more detailed examination could have been in order, but its commitment to packing every minute of its 113 minute run-time with solid action sequences is admirable in itself, and no small task. The interactions between Blunt and Cruise are a particular strong point, and it’s great to see Blunt in a role where she can be as cool as she is in the movie, the steady voice to Cruise’s constant doubt rather than the other way round, and these exchanges do bring a smile to your face, but the pace of the movie does come at the expense of some quality characterisation with the two sometimes forced to blurt out their backstories in two minute car journeys that pass a little awkwardly. 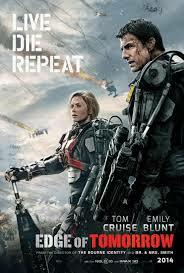 ‘Edge of Tomorrow’ is a solid adaptation from a mostly reliable director (we can forget the abomination that was ‘Jumper’ as quickly as possible) who understands how to make a lean, entertaining action flick. What it does lack is lasting impact, and while your eyes are definitely well occupied for the best part of two hours, you aren’t thinking about the film much after it has ended beyond a cursory “well, that was fun” before going back to considering which edible item you would most prefer out of all the edible items you could possibly have while that waiter taps his fingers on the table impatiently awaiting your decision. “So, I went to see that Tom Cruise sci-fi film…” you say. He hates you.